New owner, Lela Bellen, officially joins the MaidPro franchise. We think her commitment to excellence in customer service will truly bring value to the local community. MaidPro announces expansion into Ann Arbor, MI. New owner, Lela Bellen, has officially joined the MaidPro franchise. Her office is set to open in early 2016. All MaidPro employees are thoroughly trained at MaidPro University on MaidPro’s 49-Point Checklist™. This list details everything that will be cleaned in a client’s home, with a specific focus on kitchens, bathrooms, floors, and dusting. “We take pride in working with our clients to design cleanings around their needs and our service providers take pride in delighting their customers,” says Lela. Weekly, bi-weekly, monthly and one-time services are available, as are move-in and move-out cleanings. MaidPro is a Boston-based franchisor of house cleaning services with over 190 offices in 36 states, the District of Columbia and Canada. The company, which began franchising in 1997, takes pride in its strong owner community, cutting-edge technology and creative marketing. It has been honored with the Franchise Business Review’s Four-Star Rating and Franchise 50 awards every year from 2006 to 2016 for owner satisfaction. MaidPro was named one of the Top 50 Franchises for Minorities by USA Today’s Franchising Today. MaidPro is also a proud member of the International Franchise Association and the New England Franchise Association. 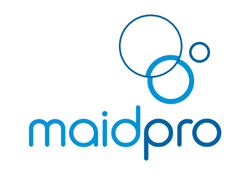 The company can be found online at http://www.maidprofranchise.com.